Originating in S.E. 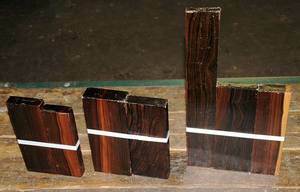 Asia, especially Indonesia, this Ebony is sometimes called Malaysian Blackwood. The heartwood is dark, sometimes with black stripes or streaking and oftentimes with a greenish cast in sharp contrast to the white to straw colored sapwood. We import this in large cants up to 8 x 14" with lengths to 10 feet. The wood is hard and heavy and is capable of a fine, high polish. Excellent for turnery and precious woodworks such as musical instruments, boxes, jewelry, etc. A each piece 15/16-1 x 2 1/2-3 x 8-8 1/2"
B each piece 1-1 7/16 x 3 1/2-3 3/4 x 8 3/4-9"
C each piece 7/16-15/1 x 2 1/2-3 1/4 x 9 5/8-16 3/8"